Muchas gracias mamá y papá for the reality of seeing the world. As my mama y papa say, hay muchos logros en que tu estes en la universidad (there are many accomplishments with you already being in college). I want to extend that to you, my fellow Latinos college student and/or grad, before we go any further. I was recently back at my alma mater, and while I was there, I couldn’t help but visualize myself as a college student again. I thought about all my classes, my professors, my friends, and my invaluable experience and education. 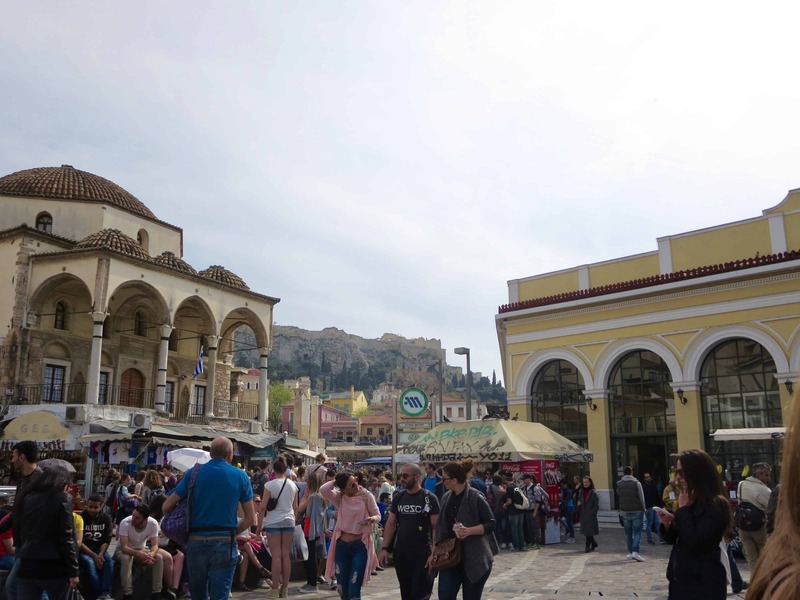 Added to that invaluable experience and education was my study abroad experience in Greece. I thought back to that time, and walking by the financial aid department, I couldn’t help but almost see myself, a nervous college junior, asking about financial aid opportunities for studying abroad. I passed by my classroom where we met to study ancient Greek civilization, as well as where we had informal conversations about Greek norms, current events and culture. I kept thinking of this nervous, but oh so exciting time in my life. The pre-departure. As the days got closer to my departure, I was so caught up in my packing, my documentation, and excitement for going to Europe for the first time in my life. I was so caught up, that I didn’t take the time to realize that though it was a happy time for me, it was also a time that my parents struggled. They dealt with the struggle to let me go, the worry about anything going bad, the worry if I needed additional financial support, and everything else under the sun. I am their first-born, and I am the test child. I am the daughter. It’s always been a learning experience for both them and I, but this learning experience involved distance, trust, and bravery on a whole new level. The idea of studying abroad didn’t fit into my mom’s head. I could feel it the day I mentioned the idea first to her. She didn’t say anything when I initially told her about my interest to do it, like she was in some sort of denial. My dad? He went into immediately talking about the financial aspect, and his worry for me going off on my own for the first time. You see, Latinos, we are very apegados or united. I always commuted for college, and I was pretty much always with my family growing up. They never even sent me to Mexico during summer break like some other Latinos parents did with their kids, because they felt that if we weren’t with them, no one else could take better care of us. Sound familiar? But they knew just how much I loved to travel, and just how ready and how much I wanted to do this. Pero al final, they are parents, and especially, Latino parents, who grew up in what seems like an entirely different world. It was hard to get them to even mention or bring up the topic of Greece for a while, almost afraid as if saying it would trigger or remind me of the urging desire to go. Ay no. My parents, mis papas not only let me go with confidence, but also, they supported me and sacrificed for what I so badly wanted to experience. Little did we all know that this was not only an investment for an international experience, but also, an investment for who I am today. Gracias por creer en mi. Thank you for believing in me. For sacrificing all you had, for seeing me go, for waiting for me to leave airport security until you couldn’t see me anymore. Thank you for being strong for holding back the sadness amidst my happiness. For putting on a brave face, and telling me how proud you were of me. Gracias for seeing the benefits I would gain from being in a total and complete new country, and on my own. Thank you for believing that I could do it, and constantly reminding me of it while I was in Greece. Thank you for supporting me financially, and making sure that I was comfortable. Gracias por dejandome volar – thank you for letting me fly. I remember when we finally talked about Greece, my dad kept saying that more than anything that he didn’t want to stand in my way of flying on my own. They both took the hard decision of stepping away, and trusting me to make the best decisions. The best decision that propelled me to fall in love with traveling. I saw a corner of the world, and that corner inspired me to further look into what the rest of the world looked like. I wanted to learn more about others, cultures, languages, foods, norms, history. I learned that the importance of travel went way beyond my preconceived notion of vacationing. I learned that travel had set my mind free, and running wild with possibilities of how life can be lived. It challenged my preconceived views, and it expanded my awareness, gratitude, empathy, and understanding. Por ustedes, I was the only Latina in my study abroad group. Por ustedes, I was seeing magical wonders that this world has. Por ustedes, I grew into someone I hope you are proud of today. You gave me something invaluable at the cost of so much. I will never be able to repay you what you’ve given me, even if I tried. Financially speaking I could, but the rest, I don’t know how to. Thank you for taking a chance, going against your fear and other people’s opinions on my leaving. For seeing my happiness and growth as the goal. Por dejarme volar, y apoyarme en mis mas grandes locuras – Muchas Gracias. For allowing me to fly, and supporting me in my biggest and wildest dreams – Thank you so much. As corny as some parts (or all) of it may seem, I wanted to be as honest and vulnerable with this post, in hopes that you didn’t just read my thoughts, but that you also felt my feelings of immense gratitude. I know that for us first generation, Latino (and in my case being a first born daughter), it’s hard to leave just like that, even if it’s for school. Whether you are leaving home for college, or leaving to study abroad or teach english abroad, it’s not easy all the time. Whether it’s financial restraints or increased responsibilities, we have it difícil but not imposible. I encourage you to look into off campus programs, summer programs, or any experiences where you can learn in a completely different surrounding. Look for resources, talk to people at your school, online, y que no te de pena! QUE. NO. TE. DE. PENA. My parents have had this saying ever since I left for Greece – ahora si quedamos bien, nosotros dejamos nuestro pais para que tu te fueras de este? – basically saying oh great, we left our country so you could just leave this one? And that’s the thing, yes so we can leave this one, because we have the opportunity to even believe in the possibility to travel outside of the 4 walls of our comfort zone, and into what life is like out there. Literally and physically. Esto es un logro. Thank you ama y apa. I hope that my words have helped any other Latinos who are currently thinking of studying abroad, or to a Latino parent just too afraid to let their niño/a go. As always, I am here if anyone out there wants to talk or needs support when it comes to studying abroad, and in general anything having to do with being a Latino/a and first generation anything. Estoy aqui, and I hope that you are too. It’s time to echarle las ganas. Nos vemos en la proxima!